Lawnmowers are basically engines with a lethal blade that spins around cutting grass as long as there's gas in the engine and a spark plug that's combusting the fuel. But if your spark plug looks like the one above, it's probably not firing properly and it's time to replace it. You begin to hear rattling, pinging or noises that suggest your mower's engine is knocking. You could also find you are using more fuel than you consider is normal for the operation of your mower. This is a key reason to ensure are spark plug is changed regularly as using excess fuel costs you money you could be spending on a chainsaw instead! The classic problem is of course that the spark plug has failed and you cannot start the engine at all! If the plug is misfiring, you may notice you may feel combustion is not efficiently happening. This occurs due to the aging of the plug. As a spark plug ignites, there's a 'gap', in which its reach occurs. This gap eventually widens as a result of repeated use under extreme temperatures, normal wear, and tear. If the 'gap' is becoming too large, the unit's efficiency declines and combustion becomes erratic. When the engine is cool, remove the spark plug wire. Clean any debris off the wire, ensure the metal is clean of rust etc. Use a spark plug wrench to gently unscrew and remove the plug. If the plug is sunk in tight, do not use excessive force. A bit of CRC or WD40 style lubricant may help. Using the correct sized plug wrench is also very important. Use a spark plug gauge to measure the gap between the two electrodes and make sure the gap reflects the recommendation of your lawnmower manufacturer - check the user manual. With your hands, sub in the new correctly sized spark plug. Screw it in gently. Then with your wrench, finalize its position with a firm turn but not so the plug is in too tight. Test you've installed it right by turning on the engine. If it fails to ignite, check the spark wire is connected. What is the correct spark plug for my lawnmower? 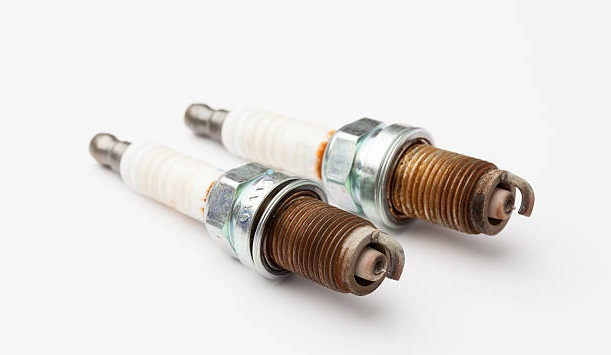 This was a good question to ask because even though several different spark plugs may screw into your mower, if it is not the correct type your engine will likely suffer performance problems. If you don't know off the top of your head what kind of spark plug is in your mower - look for the number on the ceramic and match it to the brand. The internet is your friend. Indeed, you can also take the whole unit into a service agent or hardware store and compare so you have like for like. The best trick is to look at the user manual of the lawnmower for advice. It is not imperative that use you use your mower brand's spark plug. You can use a generic substitute or another brand's as long as the size and type are correct. Generally speaking a tried and true brand like a Briggs and Stratton spark plug will work well in most engines. Battery powered lawn mowers, of course, do not need plugs! Need to change your lawnmower's oil?